Bring your favorite workplace apps to G Suite with the new G Suite Add-ons and streamline your work. Add-ons help you complete tasks directly from the G Suite app you're in, rather than needing to toggle from one app to the other. G Suite Add-ons also surface relevant information and suggest actions based on what you’re working on. For example: a salesperson can find customer info from their CRM tool while drafting a strategy doc, an engineer can add tasks to their project management app directly from Gmail, and a recruiter can consult their hiring pipeline while scheduling interviews in Calendar. 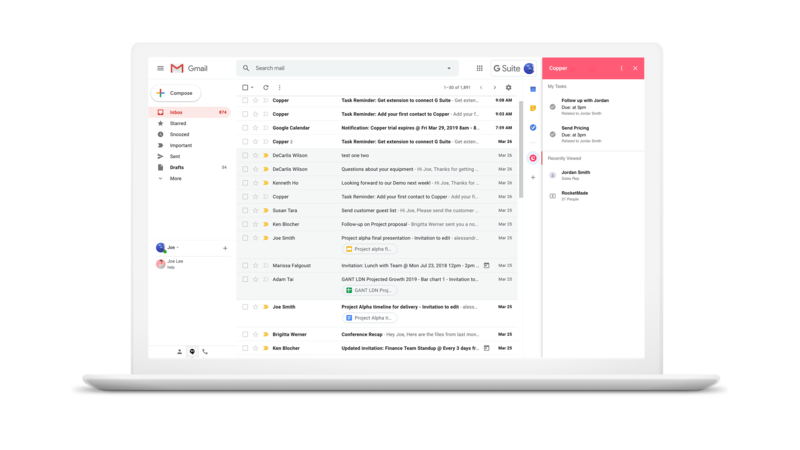 Find dozens of G Suite Add-ons from popular enterprise developers like Copper, Box, Workfront, Asana, DocuSign, and more. Add-ons will appear in the side panel across G Suite apps and help you complete entire workflows without the need to switch back and forth between multiple apps. G Suite Add-ons give you control over when and what information is shared with third-party apps. Admins can whitelist the G Suite Add-ons that meet their business needs, install them for the whole domain, and manage their permissions from the G Suite Admin Console. Admins can express interest in the G Suite Add-ons beta today to help users work faster and more efficiently across G Suite and third-party apps. The purpose of this page is to provide better visibility into our current product plans and timelines, thus it contains forward-looking statements. While we always strive to meet these timelines, this is not an official commitment, rather our current best estimate and is subject to change. Products on our roadmap and any products in an early release or testing stage are not guaranteed to become generally available, may be significantly modified from their current form, or may be launched as part of a different subscription from what is currently indicated.